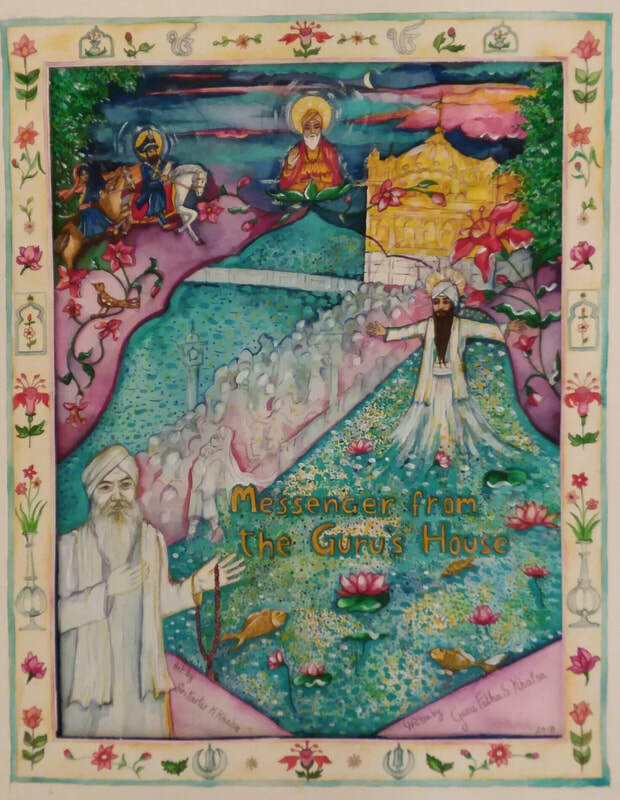 The cover art aptly introduces the theme of the messenger from the Guru's House, the title Yogi Bhajan assigned to this work. I instructed Siri Kartar to fill it with life and to include women and an infant, which she did splendidly! 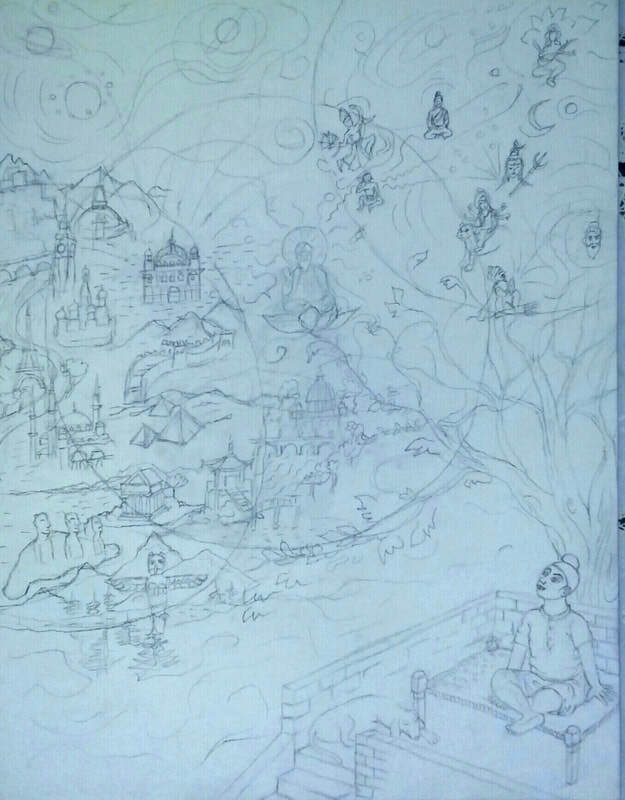 This is the artwork for the frontispiece of Part One, the story of Yogi Bhajan's life in India before embarking on his teaching mission to the West. This particular image comes from a story he told about his childhood. The Englishman asked little Harbhajan, "Could you see far away? Could you catch a glimpse of the Tower of London?" Harbhajan replied, "No, but in the sky I saw many stars and distant worlds. They are most wonderful and amazing to see, and much further than your England." As the title piece for Part Two, I selected the story of how Guru Ram Das revealed his personal mantra, "Guru Guru Wahe Guru, Guru Ram Das Guru" to Yogi Bhajan during his first pilgrimage with Western students in 1970-71. Often, Siri Kartar Kaur would try a few different approaches before settling on one. This is an example of a practice sketch she made. 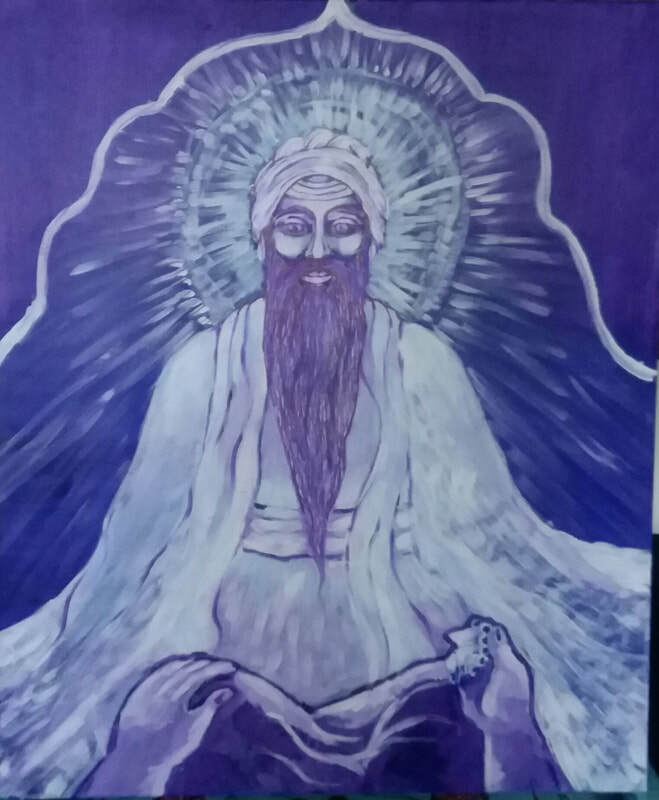 After some meditation and trial and error, Siri Kartar Kaur arrived at this luminous image of Guru Ram Das. Brilliant! Siri Kartar Kaur envisioned Guru Ram Das in the darkness of early morning from the vantage point of Yogi Bhajan. Notice Yogiji's knees and hands and mala at the bottom of the canvas. This next image is possibly the most challenging yet. 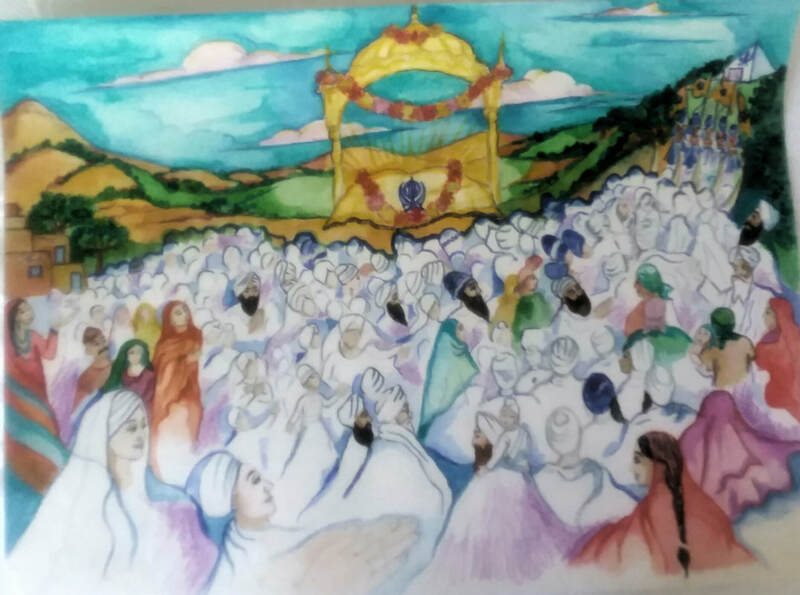 It's inspiration is derived from a vision Yogi Bhajan had of a large Sikh procession winding from Santa Fe, past Guru Ram Das Ashram, to Ram Das Puri. At the destination, you can make out the visionary Temple of Steel. Siri Kartar Kaur at Guru Ram Das Ashram in Los Angeles beneath her murals of the first four Gurus. Did you enjoy these? 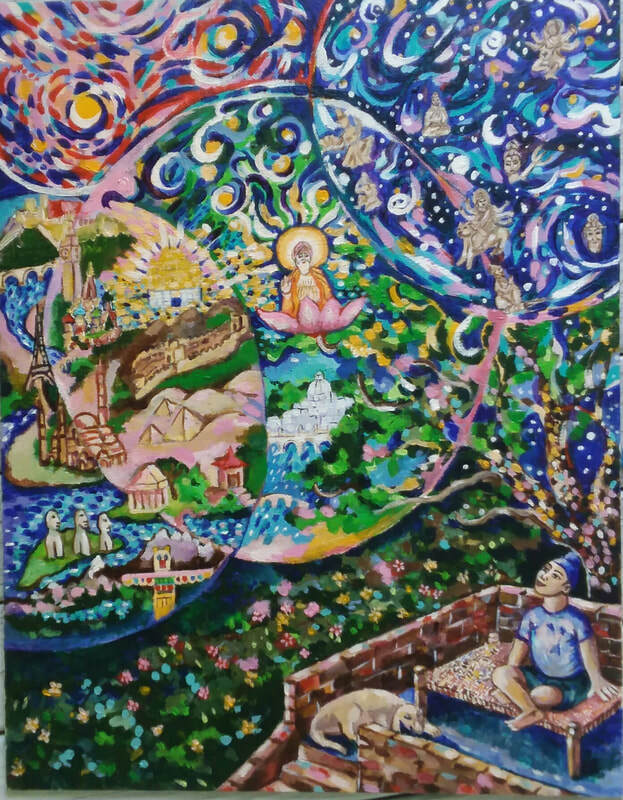 As you can see, these paintings take time to create and Siri Kartar is a gifted and dedicated artist. With the help of God and Guru, then end result will be a beautifully illustrated biography of Yogi Bhajan, published online and available free on September 13, 2018, the fiftieth anniversary of Yogiji's arrival in the West. You can support Siri Kartar Kaur in her work by making a donation today. To see our Donations Page, please click here.